The month has certainly passed by quickly and it's hard to believe that it is Christmas tomorrow. All the presents have been wrapped and today I'll be making cranberry sauce and preparing the ingredients for stuffing. Tomorrow I'm heading to my daughter's house to spend time with her, my son-in-law, 3 grandkids and my daughter's in-laws. I'm looking forward to it. I've opened the last envelope in the Advent Box. 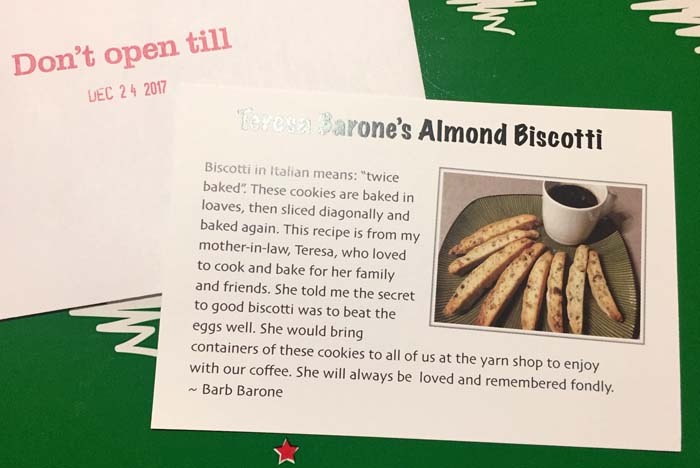 To wrap up the 24 days is a recipe for Teresa Barone's Almond Biscotti along with a nice story about where the recipe came from. I'll definitely be giving this recipe a try. Excuse the reflected light on the recipe card. 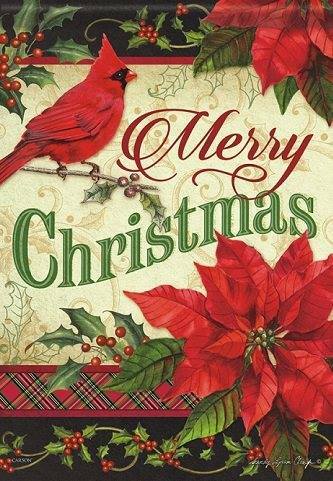 I hope that you have a wonderful Christmas and a very Happy New Year. I'll share with you a gorgeous picture from my good friend and someone I think of as a sister, Bonnie. I hope that you'll come back and visit Rhythm of the Needles again on January 1st. I'm going to relax and take a bit of a break from blogging for the coming week. I may even finish a knitting project or two.